Warning: spoilers for last night’s Supergirl episode are ahead! After outing himself last week in “Falling” following his fight with the corrupted Supergirl, J’onn J’onzz found himself in hot water. Yes, as you likely expected, a Martian impersonating the government official in charge of the Department of Extranormal Operations didn’t go over well. 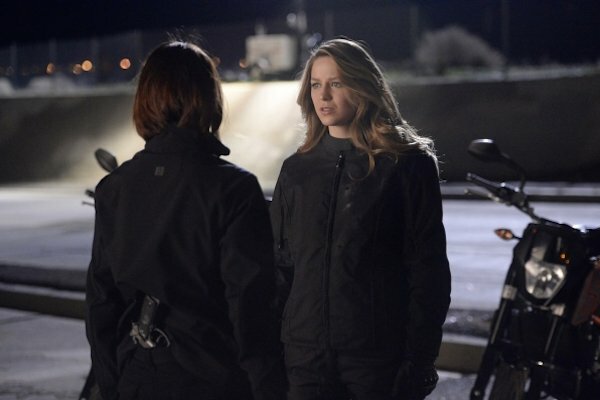 While J’onn was in custody, Supergirl fans learned how he ended up taking Hank Henshaw’s identity ten years ago, and later on, Kara revealed her identity to Lucy Lane in an attempt to win her trust and get her to help with rescuing J’onn and Alex. However, the reveal with perhaps the biggest future implications in "Manhunter" came when Kara learned where Colonel James Harper was shipping J’onn and Alex: Project Cadmus. 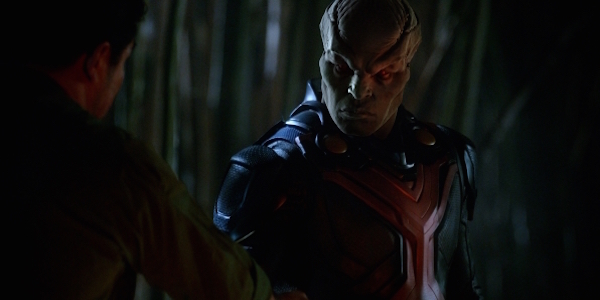 After getting everything he wanted from J’onn and discovering that Alex knew “Hank Henshaw” was an alien, Harper (who was surpassingly villainous in Supergirl despite his comic book counterpart’s heroic history) told Kara that J’onn and Alex would be imprisoned at Project Cadmus, but didn’t elaborate on what that was. Kara soon learned from James Olsen--who got the inside scoop from Superman--that Cadmus is a genetic engineering facility where aliens are experimented on by the military. If the DEO is an alien prison, then CADMUS is an alien dissection lab, and its existence is the reason Superman doesn’t work with the government. Kara and Lucy rescued J’onn and Alex before they arrived, but going off the group’s comic book history, it’s doubtful this is the last time Cadmus will play a role on the show. Project Cadmus originally debuted in 1970 as the DNA Project, but was renamed following Crisis on Infinite Earths. As a genetic research group funded by the government, the work largely revolved around clones, both normal and the DNAliens, who were created to be both enhanced and have a more extraterrestrial appearance. Arguably their greatest creation was the Kon-El/Connor Kent Superboy, who was the product of both Superman and Lex Luthor’s genetic material. The organization managed to stay afloat by going underground several times, but when Lex Luthor became president in the pre-New 52 universe, it slowly disbanded, though it’s now looming again in the New 52 universe. James Harper served Cadmus in the comics as Guardian, but considering that Supergirl’s Harper resigned after J’onn’s memory erasure, it doesn’t look like he’ll be involved with them anymore on the show. Cadmus also played villainous roles in Justice League Unlimited, Young Justice and Smallville. Despite only being mentioned in "Manhunter," Project Cadmus is too big of an organization to not play a bigger role on Supergirl, and sooner rather than later. While erasing Harper’s memories, J’onn discovered that Jeremiah Danvers, despite seemingly perishing 10 years ago, is still alive and being kept at Cadmus. So eventually that’s where J’onn and Alex will find themselves before Season 1 concludes: on a rescue mission to find out what’s been done to him. Beyond that, it’s likely that Kara will eventually find her way there and see what’s being done to the alien prisoners just so the military can develop more weapons. This could be what leads to her deciding not to work with the government, just like her cousin. It’s clear this place is a hell hole, and while there’s always the chance something good could come out of there (perhaps this is how Superboy gets introduced), it seems like Cadmus won’t have Supergirl’s best interests at heart. If the alien research leads to the infamous cloning research from the comics, the series could see more superhumans emerge from Cadmus’ depths, and it’s doubtful the majority will be keen on protecting humanity. Off the top of my head, maybe they end up developing a new Bizarro with Maxwell Lord, and this one could be a recurring threat. Hell, I wouldn’t be surprised if Cadmus went rogue and ended up being one of Season 2’s main antagonists, but it’s too soon to tell for that. Either way, expect to learn more about Project Cadmus as Supergirl progresses. Supergirl Season 1 has almost wrapped up, but fans can check out Kara’s crossover with The Flash, titled "World’s Finest," next Monday at 8 p.m. EST on CBS.